She looked in the mirror turning her face this way, then the other way, inspecting every detail of her countenance. "Humpf", she huffed disgustedly. "There's nothing to see here people, move on" she said aloud to no one as she walked out of the bathroom flicking off the light. Once she got into her car to start her drive to work, Lisa, looking into the rear view mirror, ran her fingers from her chin down to her neck. She never liked the way her chin disappeared into her neck. She sighed and thought to herself, "nothing special to look at, just an ordinary plain Jane." When she arrived in her classroom that morning, she noticed right away that one of her students had left a note on her chair. The note read: "Dear Mrs. Rinehart, you are the best teacher I've ever had." Lisa smiled and tucked the note away in her desk drawer and began writing on the chalkboard. It's Five Minute Friday. Where everyone writes for five, unedited minutes all on the same prompt. This week, that prompt is the challenge itself, the dare if you will. Lisa Jo has been encouraging honest writing and yeah baby...that is scary stuff. I’ve been writing since I was a little girl. 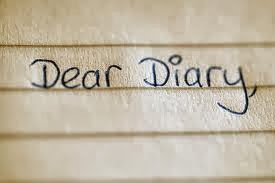 I had a diary, as most young girls do, and faithfully wrote in it whenever I felt I had something I wanted to share with myself. I used it as a sounding board. Sometimes I would go back to change my thoughts to what seemed more appropriate even though the first draft was the most honest.